Wall hung sink. The old wall-hung toilet. This thing used about 50 gallons of water every time you flushed. It made us cringe just hearing it. The old shower. Sometimes I wondered if we got clean in there. No amount of bleach could get all the stains off the floor. And a handful of the wall tiles were cracked. To the studs! Looks like there was once a recessed medicine cabinet. 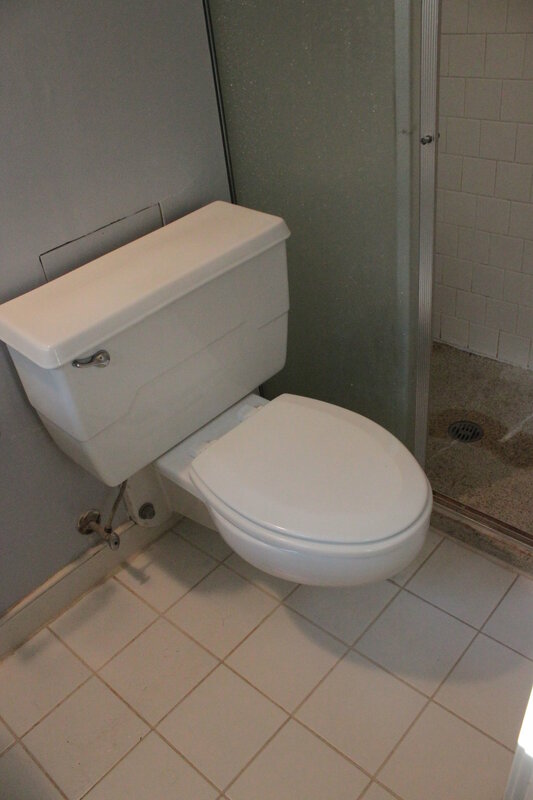 Once we removed the wall hung toilet, we were able to gain EIGHT INCHES in the small bathroom. The wall was 12" to fit the brackets for that toilet. Since this is a small bathroom, those eight inches made a huge difference. The new shower - all carerra marble! A a small seat in the back corner. Also, on the back wall there is a recessed box for your shampoo and soap. This is lined with the basketweave marble seen on the floor. The new sink vanity. I used 12x12 tiles on the floor and then an inset of basketweave, with a border of 6x12 tiles. This creates the look of a rug with the simplicity of the tile. I used all carerra marble in this bathroom. It's classic and clean. All the fixtures: knobs, towel bars, faucets, etc. are all polished chrome in a modern square shape. i liek the way the two play off of each other. What was once a dull, drab, and dingy bathroom, is now clean and fresh.